Thrustmaster offers gamers the ability to play with identical products in both hands by combining two T.16000M Flight Control System joysticks, could be handy for space flight simulation games. With the T.16000M FCS Space Sim Duo, gamers can now control their spacecraft using a joystick in each hand, in all games supporting the simultaneous use of two joysticks. This ensures even greater realism in games, particularly for Mech warrior pilots or deep space explorers. Enjoy absolute control when weaving a path through asteroid fields, avoid your opponents and target your enemies with surgical precision. 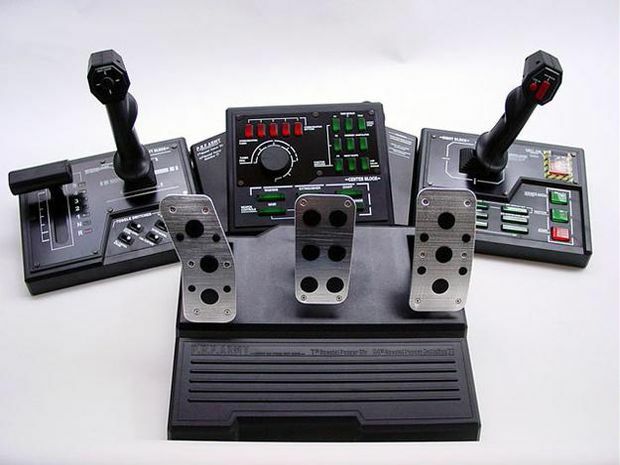 The T.16000M FCS Space Sim Duo is a pack comprising two T.16000M FCS joysticks. The fully ambidextrous controller can be configured as a left-handed or right-handed device, thanks to three detachable components. Its appearance and design ensure that it is particularly suitable for use in a dual-joystick setup. It delivers ideal comfort and excellent stability, thanks to its large handrest and weighted base. Each joystick in the T.16000M FCS Sim Space Duo pack benefits from the extreme precision of Thrustmaster’s H.E.A.R.T HallEffect AccuRate Technology™, which uses 3D magnetic sensors (Hall Effect) located in the stick to deliver precision levels 256 times greater than current systems, with a resolution reaching 16,000 x 16,000 values. As actions are frictionless, the joystick’s precision remains unaltered in time. Each joystick provides pilots with firm, linear and smooth tension, thanks to the helical spring (0.1”/2.8 mm in diameter) located inside the stick. Combining two joysticks offers no less than 32 action buttons (with Braille-style physical identifiers) and 2 multidirectional hats, providing users with a significant range of feature allocation choices. Each joystick features 4 independent axes, rotary rudders located on the stick that can be allocated to horizontal or vertical strafing manoeuvers and two triggers, offering a full-fledged arsenal of possibilities. The Thrustmaster Advanced pRogramming Graphical EdiTor software application, which enables gamers to combine a Thrustmaster joystick with other devices* from the brand, can be used to a rather unique end: managing and optimizing twinned controllers! Users can create and/or load specific mapping profiles and share them with the gaming community. If that would've been a proper 'progressive' joystick this thing would've been perfect for using as a left hander in conjunction with a mouse in SC. It would've given you 10 dimensions (6 rotation + 4 movement) to accurately utilise on the stick out of the 12 present (throttle/brake would be the scroll wheel on the mouse). I might be wrong though, but it appears to be a on/off switch type 8-pad, which means performing controlled x/z movements is not possible. I just bought the T.16000M FCS HOTAS and i'm very impressed. I wouldn't mind trying the dual stick. Sofar, except for the learning curve to tweak each game, it's great. On youtube the Noobifier does a great review on dual sticks for Star Citizen. I had to spend ages online to figure out silly things for example the X3 games basic throttle control and was actually so simple.